Arts, photo © 2008 by QuoinMonkey. All rights reserved. A few weeks ago, Liz and I and a studio mate visited the Minneapolis Institute of Arts to attend a panel discussion addressing the question — What Is the Current State of the Arts in Minnesota? There are differing opinions; it depends on who you are. Though Minnesota has traditionally been one of the most well-funded and supportive states in the U.S. for the Arts (and Minneapolis one of the most literate cities), many writers and artists will tell you that over the last 10 years, funding at the state, community, and individual levels has begun to dry up. Before the talk, we glanced around the room and wondered why the discussion was not better attended. Where was the community? Where were all the artists and writers? Where was everybody? Opening remarks were from Minneapolis City Council President Barbara Johnson, and we listened to representatives of the Walker Art Center, the Minneapolis Institute of Arts, the Minnesota Orchestra, Loft Literary Center, Guthrie Theater, and McKnight Foundation frame the discussion through a rose-colored prism. It soon became apparent that the institutions and well-oiled machines that house and fund our arts and creative programs had a totally different take than many artists I know. With few exceptions, nearly every person on the panel thought the Arts in Minnesota were doing well. One exception was program director for the arts at the McKnight Foundation, Vickie Benson who made a reference to how we can’t forget artists who live with poverty, have no health insurance, and face a lack of retirement money. And Fox 9 news anchor and moderator, Robyne Robinson, stepped in with a personal experience about how a Fox 9 news segment on the Arts she once hosted had been cut from the local news. It took courage for her to go out on that limb. You can read more about dissenting opinions at mnartists.org’s Commentary: What is the State of the Arts in Minneapolis? by Michael Fallon. Everything is conflicted. I’m an artist and writer. I attend events at the Guthrie, the Loft, the MIA. I’m a member of the Walker. Yesterday I heard an MPR piece about how funding is drying up for a local history museum in a rural Minnesota town (many museums receive Arts funding). Staff has been cut. Volunteers can’t afford the gas to get there and are asking for reimbursement. What is the state of the Arts in your hometown, state, province, or country? Are you experiencing differing opinions between Arts institutions and the writers and artists who create the work? One will not survive without the other. It is a reciprocal relationship. There is room for debate; there is always room for healthy discourse. For the time being, I’m choosing to focus on the compassion of the Bodhisattva Kuan-yin. After the panel discussion, we attended an art opening downstairs, Smoke and Mirrors by photographer Vance Gellert, and strolled through a few floors of the MIA permanent collection. 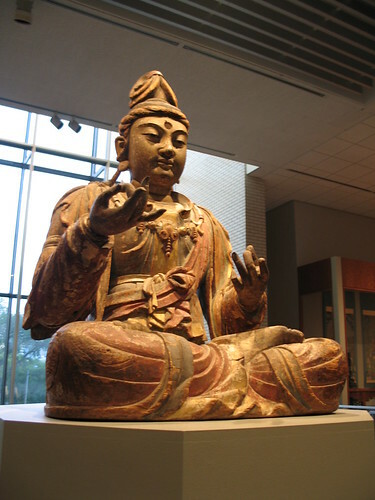 Kuan-yin had a window seat next to a series of ten to fifteen Buddhas and Bodhisattvas spanning thousands of years. Bodhisattvas are Buddhist deities who have forgone entrance into Nirvana until all beings have attained enlightenment. In China, Kuan-yin became the most popular bodhisattva and was widely worshipped as the deity of mercy and compassion. She is often depicted as female or androgynous, even though she sometimes has a mustache. According to the MIA, the Kuan-yin in these photographs is seated cross-legged in the lotus position (vajrasana), and is from the Sung dynasty (960 to 1279) noted for its art, literature and philosophy. 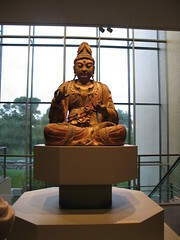 The bodhisattva is carved from movable sections of wood; the eyes are inlaid crystal, and the robes of gold leaf. Both hands are turned up with thumbs touching the middle fingers in the gesture of discourse or argumentation (varada mudra). The hair was originally encased by a gilt metal crown that is now missing. -related to posts: haiku (one-a-day) , Walking Your Talk (Do The Arts Matter? ), Does Money Soil Art? First, let me just say that the Bodhisattva Kuan-yin is magnificent. Such a solidness and presence in that sculputure that comes across even in the photo. I found Fallon’s piece to be enlightening. Clearly the moderator Robinson did her job, moving the event beyond one of publicity to the realm of reality. And yes, now the dialog can begin. QM, I can only provide anecdotal input on the state of the arts in Albuquerque. I see local artists finding more venues for their works. More grassroots shows, websites, alliances (LINK). But that doesn’t necessarily translate into income and supporting themselves through their arts. We have a growing film industry (LINK), which is about the artists and the organizations. At least that’s my impression; I could be off. I can also say that personally my discretionary funds for purchasing art have gone down the drain. With basic costs rising, I don’t see myself continuing the trend of buying several pieces of art each year. I bought two pieces early this year, but in fact, now I’m in the market to sell three other pieces I bought several years ago. I feel horrible about this, but that’s reality. I don’t think any of us expected it would get as bad as it is. The way Fallon describes the large art organizations’ responses to contingency planning — well, that was honestly frightening to read. I mean, this economic downturn, its duration so far and the outlook — none of it can be good news for these groups. They really need to get on the ball and walk through scenarios that might just come to fruition, unfortunately. ybonesy, thanks for responding. It’s a meaty topic for a Holiday weekend. I started out with just the haiku and Kuan-yin but then it grew into something more — I guess I had more to say. It’s a tough issue. Without the large institutions to buy, collect, and house the Arts, we would never be able to view something the age of Kuan-yin. I have total respect for all of the organizations who attended the panel discussion; they add so much to make the Arts community here a thriving one. But it seemed like there was a disconnect between what I see artists experiencing and the rosy picture painted at the panel discussion. I kept waiting for the conversation to take a real turn, to address the real issues that artists and writers are facing. BTW, writers are included in the umbrella of the Arts, at least in the context of this panel. The Loft was there speaking for and from their experience with community writers. 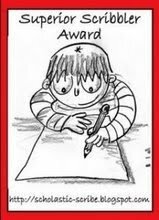 And writers receive scholarships and grants from many of the same funds that go to artists. I’m sad to hear that you have to sell a few pieces of your personal art collection. It seems that the bigger trend is trickling down to the individual level. Art and arts funding is the first thing to go. It seemed like the organizations on the panel had a kind of wait-and-see policy. Like they will ride out the economic downturn and have faith they will come out the other side. Unfortunately, many individuals don’t have that luxury. Looks from your link like the film industry is doing well in New Mexico. I wonder how other artists are faring there? The issues of artists and writers who struggle with healthcare and retirement I imagine have been around since the beginning of time. Artists used to have patrons. But these days I’ve gone to many a fundraiser for artists who have gotten sick and not had healthcare coverage. It can be debilitating. It’s strange because I think most communities want to support Arts funding, preserve their history through keeping small museums open, support local writers and artists in their communities. But the reality is they can’t afford it anymore. I was listening yesterday to an NPR show on Duluth, MN and how they are thinking of privatizing tons of things that used to be supported by the city, including the large aquarium in Canal Park, because they are just out of funds. And when funds are available, larger cities tend to get the money because more people are involved. Where are small towns and cities going to turn? As someone just getting ready to open a new little gallery, I have no grand illusions of wealth…or of even breaking even. I realize in fact I will probably lose money with the economy such as it is…and that may sound crazy to some. I’m not a wealthy person but if I keep my 30 hour a week day job to pay rent, I will be able to provide a space for Artists to show their work, to keep their dreams alive and hopefully bring some much needed culture to a tiny corner of my universe where it’s sorely lacking. Some people would say I’m crazy….That a 50 year old woman should be thinking about saving for retirement…so be it….but for me…I just cannot be happy sitting on the sidelines… waiting for someone else to care. In this short life, I need to feel like I’m doing something…anything… meaningful…for my head, my soul…and for others as well. I have no idea whether it will work out or not…but I am so hopeful….and without hope…what else is there? avenuestudio — you are saving something much more precious than just saving for retirement… one is money … the other is … priceless. Investing in a dream, or in your heart’s desire will support you in a different wonderful way. QM, great post. My sense here in Wyoming is that many artists are working “regular jobs” to pay the bills and that they are just plain out of time and energy to keep producing art, which is their passion. Big name artists seem to be faring better than little-known ones and on the international art scene recently, paintings have been selling at auction for record prices. It is a curious contrast. Way to go! It is totally Kuan-yin, backwards, forwards and inside-out. Heather, I don’t think you are crazy. You are doing society a great service and enriching your corner of the world. The huge institutions are great and noble and I am thankful that museums all over the world preserve that part of world history. But it’s the small galleries, the artists that show there, the people that come out to see them — and people like you that keep art alive and affordable at the grass roots level. I really appreciate your comment. And admire what you are doing. You are doing what you love. I don’t have any illusions either about wealth from writing or art. Those who make a living off of their work are few. Like you, most of us have the structure of other jobs that help keep us afloat. I’m not so sure that’s a bad thing. Some days I am happy to do a little part-time work so that I still have energy for my writing and art. I have every confidence in you and totally believe it’s all going to work out. You are such a positive person, a positive force in the world. There is nothing else without hope. We all need to believe in something. And hopefully make a difference for someone else along the way. breathepeace, I must have been writing that last comment at the same time you were writing yours. I had not even noticed that you could scramble the haiku – you are right — it totally works. Thank you for the awareness! It *is* a curious contrast — the big name artists who command so much money for the work and the relative unknowns. I wonder how much of that is driven by wealthy art collectors to keep the value of the work up. I don’t know much about that part of the art world. But I have always been struck by those who “make it” and those who don’t. Is it timing, what the culture is ready to receive, opportunity, a mentor, a teacher, someone that notices, or pure dumb luck? It truly is a curious thing. The relationship between what we do for $$$ or to make a living, and making art or writing — I think we could write a book on it. Someone probably already has. Artists and writers take a lot of risks for their work, for what they are passionate about. Okay, I’ll dip my hand in the Rio Grande for you, but the rest of the body is following it in for me! QM, back to your question about the small towns in rural areas, I have another little anecdote to share. About three or so years ago, there was a grassroots effort to start up a museum in the town of Questa, about 40 miles north of Taos. The first exhibit was historical, highlighting families from each of about six surrounding towns. Costilla was one of the towns, and my father’s family was highlighted. That museum effort recently shut down completely. I received all the photographs back that I had had made. It was kind of sad in that it was an effort to create something outside State-funded network of arts (I mean, given the challenges funding existing museums, no chance that the State would start up a new one). Some of the main costs, since was all-volunteer, was heating the building in the freezing cold winters of that part of NM. Oh, and btw, the home it was situated in was another adobe built by a transplanted NY socialite along the lines of Mabel Dodge, but someone else, and now I can’t recall who. But same era, same wave. I’ll try to find out, since I know you’ll want to know more. I sincerely hope you both do come. Breathepeace, you should come too! And bring some work to show! I have a tiny house but you are all welcome to stay…and we can ride over to the gallery on my Halloween golf cart with it’s black diamond plate flames… Wouldn’t we all be a site! I’d love it! QM, I love the thought of the grass roots level…you totally get it and why it’s so darn important to me. I am most appreciative of all your kind and encouraging words. I am both frightened and happy at the same time. No one knows the future but I will do my very best to honor your faith in me. ybonesy, that’s really sad about the small local museum effort in Questa shutting down. And that it would have included your family history from Costilla, too. I think we are going to see more and more of this over the coming years. BTW, you mentioned heating the place in winter — that was exactly what the woman from the small town in Minnesota (I wish I could remember the name of the town) said about the local museum there. She said the cost of heating and cooling the place alone ran around $15,000 a year. Can you imagine how these grass roots efforts must be struggling to stay afloat? It makes me admire even more what Heather is trying to do with her small gallery. And yeah, if you remember or find out more about the adobe where they were going to house the museum in Questa (built by that transplanted NY socialite along the lines of Mabel Dodge), I’d love to hear more. I like tidbits of history like that. It never materialized. They said it (they maybe even meant it), but when it got right down to it, they all still charged me full price. Some of them continue talking about it as though they are acting the role of patron. It is odd, uncomfortable. In John Gardner’s book On Becoming a Novelist he talks about the difficulty of living off other people while trying to paint or write. You begin to owe people in all kinds of emotional ways, they grow impatient with your process and how long it is taking, you begin to feel bad about yourself. For now (and I guess everything is subject to change), I’m really happy to have a 30-hour/week job with no stress. It keeps me solvent, and (most of all) keeps me free. Teri, thanks for your comment. It’s interesting to read how some people rallied to support you around money in the early days of your post 40-hour-a-week job. (Even though they didn’t or couldn’t deliver as true patrons.) It’s not something I experienced out in the day-to-day world. But what I have found is that my family, and Liz (and her family), my mentors, and my immediate close friends have really stepped up to the plate in terms of supporting me. And that has manifested in many, many different ways, some of it financial. It can be as simple as viewing my work, taking me out to dinner to talk about my work, frequent flyer miles, scholarships, driving me an hour and a half to an airport it’s cheaper for me to fly in and out of, listening when I feel frustrated, or putting up with all my endless research and questions when we head South. 8) I am grateful for that abundance in my life. Lately, I have been thinking more and more about “other” work (ways I make a living besides my creative work of writing and art) as a gift more than a challenge. When I first left my 40 hr a week job, I was fried on it. I have a much more low stress part-time job now that doesn’t take as much out of me; I still have energy to write. The downside is it doesn’t pay as much. I ping-pong back and forth between all of these things. And I have a feeling it’s going to be like that for some time to come – managing what I do for work with my creative work life. Some days it’s more of a struggle than others. I know that artists are thriving as far as making art in New Mexico and seem to be hugely generous in participating in many venues where they/we are asked to donate work. The selling is slower unless one is an artist that sells to the high end market, as they always have $ to spend. And indeed, Santa Fe appears to be doing well with its artists’ markets. Folk art seems to be selling fairly well, still. We’ll see — the 5th Annual International Folk Art Festival is almost upon us — folk artists from all over the world. I’ll be interested to hear how that goes. ybonesy, thanks for adding the comment on the Arts in New Mexico. It will be interesting to hear how it goes at the 5th Annual International Folk Art Festival. About donating work and the generosity of artists, I have a friend who recently donated a painting to a silent auction for a good cause. Her paintings sell from $400 to $500. I find many artists to be incredibly generous in that way. At the last Art-A-Whirl, one of the grassroots events that happens in the Northeast and Warehouse districts of Minneapolis every May, I had several friends who sold work – 3 paintings and, I think, a clay mask. Neither of them had sold anything in a while so it was a big boost for them.